But hereby the follow up! And finally we are going to do what we came here for. Although the first 3 weeks were better than expected, especial at the Ashram, because of the nice people, This is our big adventure. Can you imagine what we thought about the driving here! Trucks are driving at both lanes. If you study it well you can see a sort of regularity: petrol trucks always drive on the right lane (for us, the fast lane), the Tata trucks, do as we should expect, but, just like everyone else, never look in their mirrors. So we sort of slalom through the trafic. Then you have to watch out for motorcyclist. They come from everywhere. There are people walking on the highway, crossing, or just on the side and dogs, cows and goats...... One big mess! We also found out, that our bikes are something unexpected in trafic as well. Other drivers think of us as “normal” motorbikes (mostly between 125 – 250 cc) and our 1150 cc is totally underrated. The normal Motorbikes are low in the excisting unwritten laws in trafic: Fast cars and 4x4 drives are high up, then the different trucks, motorbikes and walking trafic. We are nothing in this pick order..... So we have to watch out and behave like all the other motorcyclist. Our maximum speed is about a 100 km/h. IN that we match more with the fast cars. A difficult situation. A total mess in our opinion. The first km's we have to adjust to all of this and later on we are able to look around a bit more. Just like the train rides you can see the little villages, with small huts. We have the feeling of being in a African documentary. As we stopped at a restaurant, the same ritual passes by as before: loads of people are coming from everywhere to watch the bikes..... While eating a man came to our table, accomplished by a man with camera. The local press was informed.... We were interview, photographed, filmed. It was like at the Taj Mahal! But now the motorbikes where the attraction. We continued our trip and as it became dark, we decided to look for a place to stay. But we were in the the middle of nowhere..... We saw a restaurant with a “hotel” sign. It was one of the highway restaurants with an open front. IN the back of the restaurant there were some walls for separation, without doors. Ok for us. It was sort of quit, beside the noise of the road. W were allowed to put the motorbikes in the restaurant, save! The wooden banks were made to sit and sleep on and were put in tho the “rooms”. Now our camping gear was usefull. Nice to have a soft sleeping mat. And ohhh it was so hot in Varanasi. After a shower, a good meal and some rest we went for a walk along the Ganga. We saw the funeral/burning rituals. Amazing. Later that evening we went for a boottrip on the Ganga to see some more of these funaral rituals and of course the Aarti (sunset ritual) Especialy the cremations were very impressive........ The Aarti in Rishikesh was much more interesting! The whole atmosphere was different. 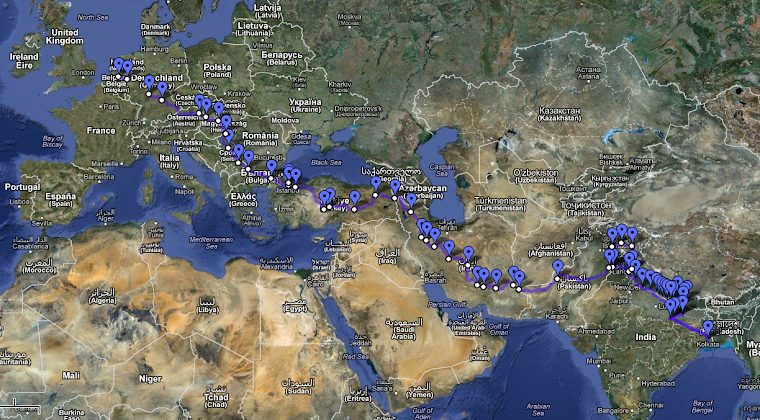 On saturday the next ride was on the program: to Katmandu, about 700 km. We left early at 7:00pm. The road conditions changed a lot and on this route there was a lot of work in progress... lots of stones.... But that's were the bikes are made for and we actually liked the changes. It was hard sometimes to manage everything: road conditions, traffic, but a real challenge. At 17:00 we arrived in Mothahari, a not particularly interesting place to be, but again we found a reasonable place to stay and restaurant. There were problems with the electricity, so our airco room was non airco during most of the night and we bargained about the (I must say high) price. Another 55km to the Nepali border! We left at 7:00pm and arrived at 8:45pm. Again the roads were bad.... At the border we were welcomed warmly and directed to the right offices. First we had to go to the Indian immigration office to check our passports an then to the custom office to get the right stamps on our “carnet de passages” for the bikes. The same ritual at the Nepali border. And again very friendly and welcoming. It all took us 2 hours. We didn't have to wait, it just takes that much time to do the paperwork. And again we got a nice cup of tea while waiting. The scenery changed, it was green, curves, not so busy on the road, friendly people, waving at us and saying goodbye, hello, or welcome in Nepal.